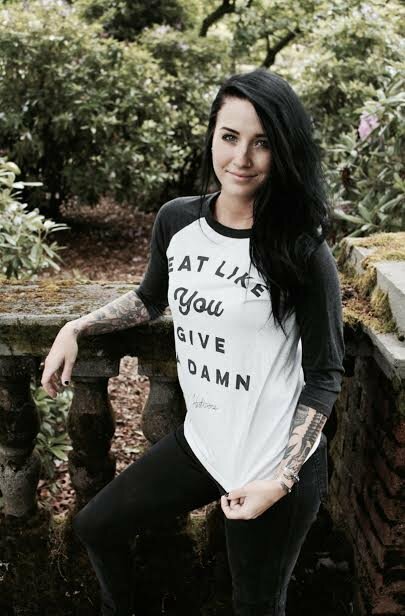 Eat Like You Give A Damn Unisex Baseball Tee ON SALE! When you Eat Like You Give A Damn you choose to actively care for the planet, the animals, your health, and every other issue related to what you eat. More than just following a vegan diet, eating like you give a damn comes down to making conscientious decisions based on where your food comes from, how it is grown, how much packaging it uses, and so on. It may be impossible to make choices that that do absolutely no harm, but we often have the power to make better choices inside our vegan framework. Being vegan is a monumental step towards a compassionate future, but we still need to give a damn about other issues; whether workers are being paid a fair wage, whether companies are using sustainable practices, etc. A perfect world may be unreachable, but we can at least give a damn, try our best, and harm as little as possible at the dinner table and elsewhere. This week our Eat Like You Give A Damn Unisex Baseball Tee is on sale for $25! Grab this cozy baseball tee while it's on sale! Wear it as a reminder to others as well as yourself to live as consciously as possible and make compassionate decisions.